The Do Not Call and Do Not Text lists prevent anyone on your CallTrackingMetrics account from calling or sending text messages to numbers that have been added to those lists. Both lists can be updated manually (by entering numbers yourself or by uploading a CSV file) or automatically (via triggers or voice menu options). If you have an agency account, you will have the option to save numbers to all subaccounts in your agency. Numbers that have been added to the Do Not Call and Do Not Text lists are still able to call or text your tracking numbers. If you need to block someone from contacting you, use the blocked numbers list in your account. Navigate to Calls → Do Not Call List (or Texts → Do Not Text List). Click New Numbers (or New Do Not Text). On the next screen, you can choose to upload a CSV file or to enter numbers in a text field. To use a CSV file, select the country code for the numbers in the file, then click Choose File. When the file loads, select the column in the spreadsheet that contains the numbers you wish to add to the list. To enter numbers in a text field, click Manual Add, then type or paste the numbers into the provided field. Numbers must have the country code included (ex: +15551234567). If you are adding multiple numbers, put one number on each line. If you wish to add these numbers to the Do Not Text list (or Do Not Call list) as well, check the box provided. 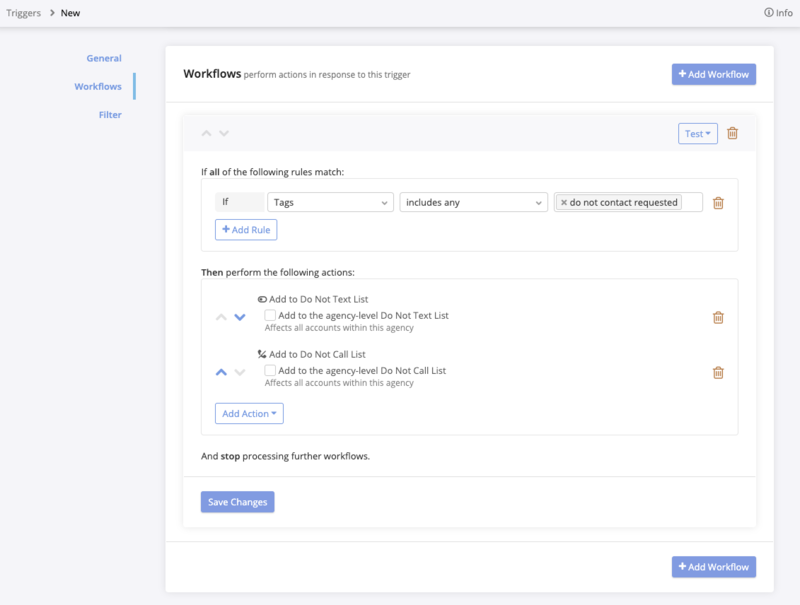 You can use trigger workflows to automate the process of adding numbers to the Do Not Call and Do Not Text lists, giving callers the option of adding themselves to either list. You can also use a voice menu option to allow callers to add themselves to the Do Not Call list. If you are already routing your calls through a voice menu, make sure the prompt that plays to your callers explains which keypress they should use to be put on the Do Not Call list. Otherwise, you will need to create a new menu and make sure your callers are routed there so that they will be presented with the options you configured. Navigate to Numbers → Voice Menus and click edit next to the menu you want to add a new option to. If you do not already have a voice menu in your account, follow the directions here to create a new one. Click or scroll to the Menu Items section and click +Add Menu Item to create a new keypress option. Use the drop-down menu to select Do Not Call. By default, the keypress for this option will be the next available number that hasn’t been used in this menu. If needed, you can change that number to a different one. By default, no message is played to the caller after they press the number associated with this menu item. If you wish to play a message (such as “thank you, you will not be called in the future”), use the Play Message field to enter or upload the message. You can use any combination of trigger conditions to create rules for when these lists will be updated. 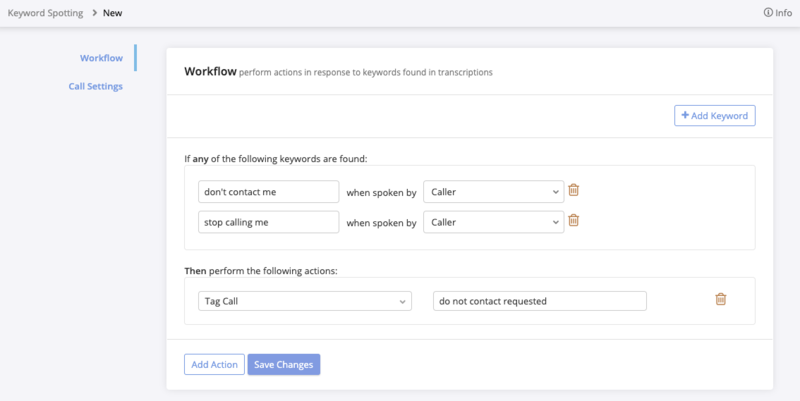 For example, you could have a keyword spotting rule configured to detect phrases like “don’t contact me” or “stop calling me” and then tag them with “do not contact requested.” You can then configure your trigger to automatically add them to your Do Not Call and Do Not Text lists when that tag has been applied to a call. For more information about configuring triggers, see the full article here. Navigate to Calls → Triggers. If you do not have any triggers in your account, you will be directed to a new setup page. Otherwise, click New Trigger in the upper right corner. Enter a name and optional description for the trigger so you will recognize it. Select when you would like the trigger to run. For this example, you may wish to have the trigger run at the end of the call, when the system has had a chance to detect keywords and apply tags. If you wish to apply this trigger to all of your tracking numbers, click the “Trigger for all Activities” toggle. Otherwise, you can select specific tracking numbers once the trigger has been saved. In the Workflows section, click + Add Workflow. Use the drop-downs in the rules section to apply any conditions you would like to control when callers will be added to the Do Not Call or Do Not Text lists. Click Add Action and select Add to Do Not Call List, Add to Do Not Text List, or both. If you want to add this caller to these lists for all of your subaccounts, make sure the appropriate boxes are checked. If you need to review or remove numbers from your Do Not Call or Do Not Text lists, you can do so by navigating to Calls → Do Not Call List or Texts → Do Not Text List. To remove a number, click Remove next to the number in the appropriate list, then confirm on the following page. The Do Not Call list page will list each number and the date it was added. The Do Not Text list page includes some extra information, including the person who added the number to the list, how many times an attempt to text the number has blocked, and the date this last occurred (if applicable).